Mat rental can help keep your offices clean. When you hear the phrase “Mat Rental,” what comes to mind? If you are like most people, you probably envision mats in the entryways of buildings to help prevent slip and fall injuries. However, mats serve many more functions than simply wicking away moisture. Mat rental can help. Did you know that Lord Baltimore’s walk off mats can help eliminate 80% of the soil entering your building? 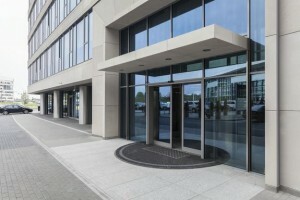 This is not only helpful in entryways, but also transition areas, such as those connecting your warehouse to your offices. Eliminate scuffed, dirty floors and worn, soiled carpets with mat rental. If your employees are constantly on their feet, fatigue can become a very real problem. Such employees need soft cushioned anti-fatigued mats to help ease or even eliminate leg, foot, and lower back fatigue and pain. As they say, a comfortable employee is a happy employee, and a happy employee is a productive employee. Anti-fatigue mats can be used in offices, in retail establishments, warehouses, laboratory / pharmaceutical environments, and more. Plus, Lord Baltimore’s mats are static dissipative, which can help reduce paper jams when used around copiers and printers. Not only can mats help eliminate dirt and moisture, but they can also help further your company’s branding efforts by putting your logo front and center in each entryway. This will ensure that your logo is the first thing customers and clients see when they enter your offices, and the last thing they see when they leave. Of course, slip and fall injuries can occur in office settings as well, especially in break rooms and lunchrooms. According to Industrial Safety & Occupational Health Markets 5th edition, 85% of all worker’s compensation claims are attributed to employees slipping on slick floors. So, it pays to invest in mat rental for use around water fountains, refrigerators, and more. Our mats can hold up to eight pounds of water. For over forty years, Lord Baltimore has provided reliable, cost effective uniform, towel, and mat rental services throughout Maryland, Washington DC, Northern Virginia, Southern Pennsylvania, and Delaware. We are an independently owned company, confident in our ability to provide you with service above and beyond uniform rental industry standards. To learn more about how Mat Rental can help improve your offices, please contact Joe Bateman at Lord Baltimore by calling 800-292-1224 or visit LordBaltimoreUniform.com. We also handle towel rental for gyms and salons; apron, towels, uniforms and mats for restaurants; and uniform, shop towel, fender cover and mat rental for manufacturing and automotive industries. This entry was posted on Wednesday, April 29th, 2015	at 5:43 pm	. You can follow any responses to this entry through the RSS 2.0	feed. Both comments and pings are currently closed.